Fair Isle lies between Orkney and the Shetland Islands, about 25 miles South of Sumburgh Head. Britain's most isolated populated island measures 3.5 miles in length and about 1.5 miles wide. Norse settlers named it Fridarey - the island of peace - but this stepping stone in the sea was also vital in times of strife, when the Earls of Orkney and Viking warlords before them used it as a look-out post and for sending fire signals to and from Shetland. The sagas tell how Kari the Viking wintered here on his voyage to the Hebrides. Later it was visited by the brave men who brought Christianity to the north. For thousands of years Fair Isle has been a useful landmark for shipping but in storms and fog its coastline is highly dangerous. Over the centuries the island changed hands many times, paying rent in butter, cloth and fish oil - usually to absentee landlords who rarely visited. Communications with the outside world were difficult and sporadic. Only in the late 20th century did the island acquire a safe summer harbour, at North Haven, and even today the mailboat has to be hauled out of the water from the reach of winter storms. 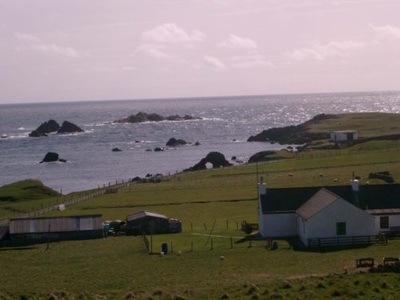 Fair Isle has been more intensively studied by archaeologists than almost any area of its size in Scotland. They’ve found evidence that the isle may have been settled by Neolithic people up to 5,000 years ago. There are traces of oval-shaped stone houses, perhaps 3,000 years old, and lines of turf and stone walls, or dykes, which snake across the landscape. The "Feely Dyke", a massive turf rampart which divides the common grazings from the crofts, may also be prehistoric. 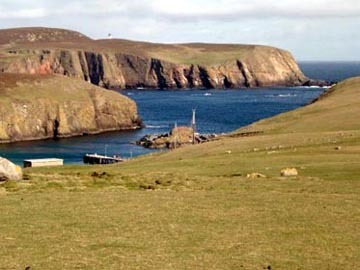 The island’s historic role as a signal station continues today with its high-technology relay stations carrying vital TV, radio, telephone and military communication links between Shetland, Orkney and the Scottish mainland. Today the island has a steady population of around 70, most of whom are involved in either Farming or Fishing. FairIsle - Best source of Fair Isle info on the net. Run by a resident of 30+ years Dave Wheeler. Contains pretty much all you'll need to know if planning a trip or just looking for some excellent pictures or island history. 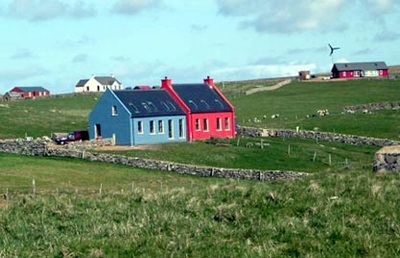 Fair Isle Bird Observatory - Looking to spend some time on Fair Isle...then why not try here? Shetland Heritage - Fair Isle section from the excellent Shetland Heritage site. Visit Shetland - Fair Isle page from the Visit Shetland site contains plenty of information...including how to get there.